George William Webb’s birth was registered in the first quarter of 1885 in Dunton Bassett near Lutterworth, Leicestershire. In 1891 he was aged 6 and at home with his parents William (Labourer) and Mary Ann Webb (nee Crane) in Dunton Bassett, with siblings Emma aged 7, Carrie aged 4 and Leonard aged 1. In 1901 he was boarding with Mr and Mrs Hall at 43 Lawford Road, Rugby and was working as a Labourer at the Cement Works in Rugby. He joined the militia of the 1st Battalion of the Leicestershire Regiment (Regimental number 6548) in 1902, aged 17, having signed up for 12 years. In 1905 his military record states he was fit for India. However by 1911, aged 26, he was back living with his parents and younger brothers Alfred, aged 14 and Lewis, aged 10, and was working as a Bricklayers Labourer. He married Carrie in about 1912 (name and date not verified) and had two children, one of whom was born after his death. He was working in the winding department of BTH when called up in August 1914, again into the 1st Battalion of the Leicester Regiment. On 19 August 1914 the Battalion moved to Cambridge and left for France landing at St Nazaire on 10 September 1914. In the Spring of 1915 it appears George was involved in the action of Bois Grenier, which was a diversionary attack coinciding with the Battle of Loos. Bois Grenier is a small village in the Department of the Nord, about 4 kilometres due South of Armentieres. 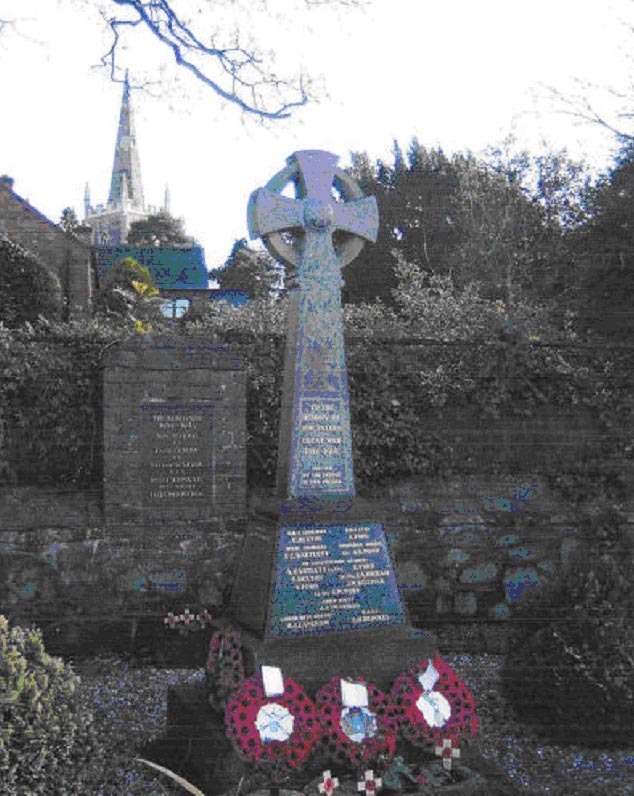 George William Webb’s name also appears on the Memorial Cross, Main Road, Dunton Bassett. A report of George Webb’s death was published in the Rugby Advertiser on 1 May 2015 stating that Lance Corporal G Webb was killed by the bursting of a shrapnel shell in his trench on Wednesday afternoon April 28th. Death was stated as instantaneous. He served 8 years in the Army, five of which were in India and four in reserve. Following his death his wife was delivered of his effects, listed below, and later his War and Victory Medals. From November 1915 Carrie Webb was granted a pension of 18/6 per week for her and her two children. John Henry Green was baptised on 24 October 1880 at Newbold on Avon, the son of Thomas Green and Rhoda (nee Matthews). On their marriage in the same church in 1876, Thomas’ occupation was labourer and they both resided in Long Lawford. In 1881 Thomas, an agricultural labourer, and Rhoda were living in Newton. Neither John nor his elder brother Thomas were listed with them on the census. By 1891 Thomas was an engine driver and the family were living in Catthorpe. John was aged 10 and there were three more children: George (9) and Sarah Ann (7). The family was still in Catthorpe in 1901, when John was a 20 year old labourer/carman. The following year John Henry Green married Elizabeth Annie P S Wheeler and by the 1911 census the couple were living in Catthorpe with their four children. John was a farm labourer. It is not known when he joined the 7th Battalion, Leicestershire Regiment (regimental no. 16825), but he served for less than six months. We have been unable to find him on the medal rolls, so perhaps he never went abroad. 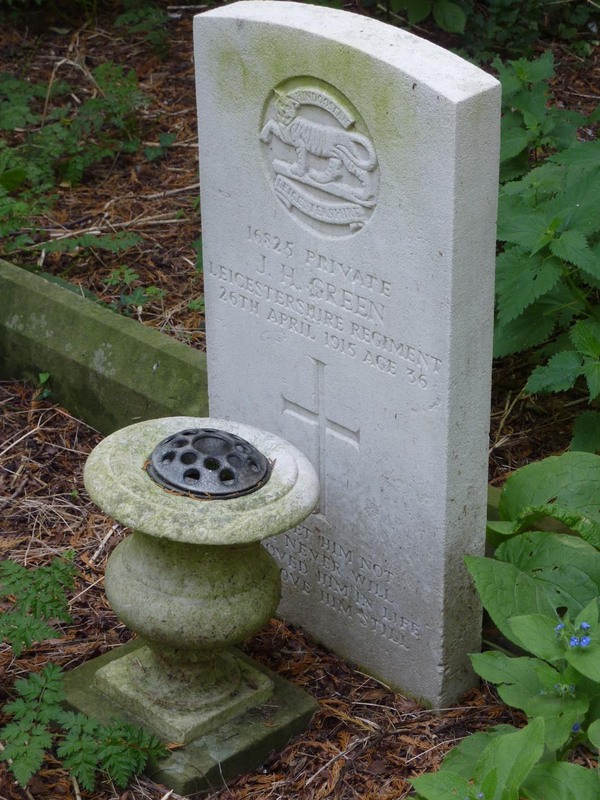 He died in Tidworth Military Hospital on 26th April 1915 after an operation and was buried in Catthorpe Churchyard. “There were many beautiful floral tributes, and in addition to those sent by the relatives, from the following friends:- “A” Company 7th Leicesters; N.C.O.’s and men of 7th Leicesters; A Friend; Alice and Bernard Robinson; His Village Friends; Mr & Mrs Nash and his Fellow Workmen on the Catthorpe Estate; Miss Emily Lloyd Spier. John Thomas Gurney. Lance Corporal. 1st Btn Royal Warwickshire Regiment. Died 25th April 1915. John Thomas was the son of James & Minnie Priscilla Gurney, he was born December Qtr 1884 in Catthorpe Leicestershire. James was born in Rugby and became a cattleman and herdsman in Catthorpe Leics. He later returned to live in Rugby. John was the eldest of 6 children, only 3 were to survive to 1911. He helped his father on the farm and in 1901 aged 16 he was recorded a “Cowman on Farm” in Catthorpe. By 1911, John now aged 25 years and single, had enlisted in the Army, the 1st Btn Royal Warwickshire Regiment, and was serving in India and Ceylon, with the rank of Lance Corporal. Reg No 316. John died 25th April 1915 aged 31 years. He is Remembered With Honours in The New Irish Farm Cemetery. West Vlaanderen Belgium. Known to the troops as “Irish Farm” and contained 54 soldiers, later to be enlarged as time passed. He was awarded 3 medals; Victory Medal, British Medal and Clasp. Qualifying date 19th September 1915. Killed in Action. In July 1895 he joined the army, the Shropshire Light Infantry. He gave his age as 18 years 5 months, in fact he was a year younger. He was 5ft 6in tall, with a fresh complexion, grey eyes and light hair. The start of his service was troubled, as he was tied for various offences: striking a superior officer (1896), wilfully injuring property belonging to a comrade and using insulting language to his superior officer (1898) and drunkenness (1899). He served in India for 5 years and in 1904 applied to extend his service to twelve years. He returned to India for nearly four years and was then discharged on 12 Nov 1907, on termination of period of engagement. By 1911 he was back in Rugby, boarding at 9 Lago Place. Aged 36 (actually 33) , he was a labourer at the B.T.H. works. Sometime after the start of the war he was back in the army, this time in the Royal Warwickshire Regiment. He entered France on the 7 April 1915. Less than three weeks later he was killed in the second battle of Ypres. 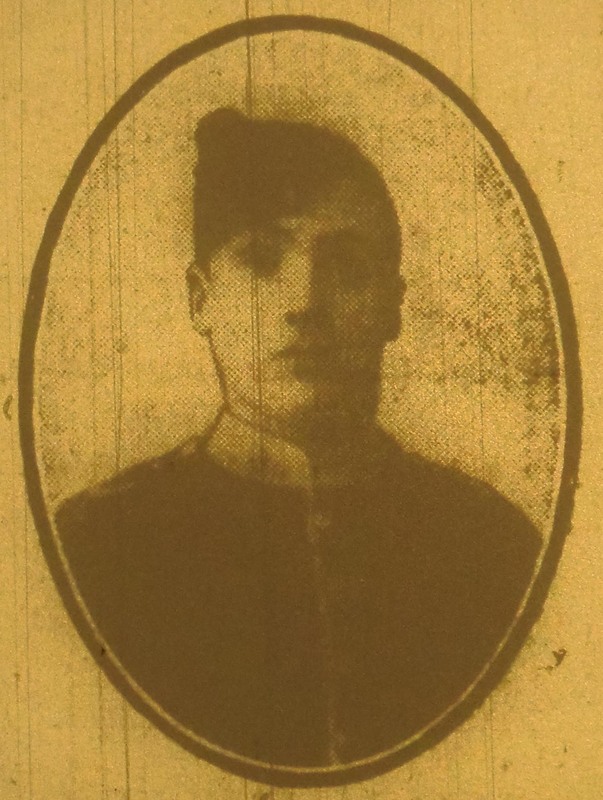 Private Charles Reginald Gartenfield, service no. 3274, 1st Bn, Royal Warwickshire Regiment is listed on the Ypres, Menin Gate Memorial, panel 8. He was aged 37. He is listed as Charles R Gartenfield on BTH memorial, but as C R Gardenfelt on Rugby Memorial Gates. William Henry Smith was born on 14th May 1887 and baptised 21st June in Hillmorton. His parents were John Henry Smith and Harriett (nee Kirby),who were married in 1884. John Henry was a builder’s labourer and the family lived in Upper Street, Hillmorton. By 1901 the family had moved to 5 Sun Street, Rugby. John & Harriett now had four sons – William Henry, at 13, was the second oldest. John was working as a bricklayer. In September 1902, John Henry Smith, who was employed by Messrs Hollowell & Sons, was working in Clifton upon Dunsmore. He was in the process of demolishing a tall wall when it collapsed on top of him. He was severely injured and died in Rugby Hospital a few hours later. He was aged 37 and was buried in Clifton. By 1911, Harriett, a 45 year old widow was still living in Sun Street. William Henry, aged 23, was living with her. He was an unemployed general labourer. In early 1914 Harriett married John Stemp. William Henry joined up at the start of the war, on 6th August. Like his father, he had been working as a bricklayer. According to a report in the Rugby Advertiser he attended Cambridge Street Mission Church. He was keen player of football and cricket, and as a boxer he had won a silver cup in a competition. He was engaged to be married. It was not to be third time lucky. 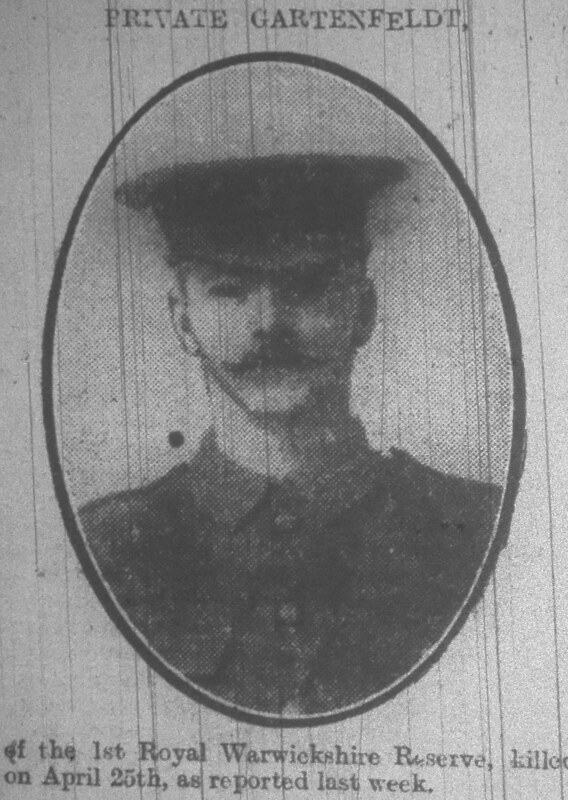 William Henry was killed in action at Hill 60 on April 25th 1915. Hill 60 was a spoil heap, south of Ypres. It was the first British operation in which tunnels were dug and mines laid. 5,200 lbs (2, 340 kg) of explosives were detonated on 17th April and fighting continued for several days. He was buried locally and his body reburied at Oosttaverne Wood Cemetery after the Armistice. Many of the surrounding graves are listed as “unknown soldier” but he was identified by a locket inscribed N. G. W. S.
Perhaps N.G. was his fiancée. Cecil James Beard was born on 28th March 1894 in Brushbury in Wolverhampton, Staffordshire. His parents were Cornelius James and Gertrude Alice (nee James). Cornelius was a telegraph clerk and shortly after Cecil’s birth the family moved to Rugby. In 1901 they lived at 30 Charlotte Street. In 1911 Cecil was boarding with the Bradley family at 36 Windsor Street. He was a loco fitter’s labourer The rest of the family were at 46 Murray Road. By the start of the war, Cecil (now known as James) was in Canada and signed up to the 13th Canadian Battalion, The Royal Highlanders of Canada, on 23rd September 1914. He was 5ft 6in tall with brown eyes and dark brown hair. He had a tattoo of clasped hands on his right forearm. On 3rd October 1914 the unit sailed for Europe. He died on 24th April 1915, probably in the Battle of Gravenstafel (22–23 April 1915), part of the Second Battle of Ypres. It was during this battle that the German Army used Chlorine gas for the first time. The battalion suffered 3,058 casualties on the 24th. “ E ” COMPANY AT THE FRONT. THE HOWITZERS AT THE FRONT. The Howitzer Battery played their first football match in France on Saturday, April 17th. Teams:— Gunners : A Goode, Major Nickalls, Spicer, Bombardier Jesson, Corpl Watson, Lieut Pridmore, Smith, Alsop, Asher, Laurceston, and Judd. Drivers : Mills, Sergt Dosher, Woolley, Corpl Shelley, Ashworth, Wood, Judd, Turner, Taylor, Dyer, Humphries. Referee: Gunner A Jobey. The match was played just behind the firing line. The Gunners proved to be dead on the target as per usual, leading 2-0 at the interval. The Drivers proved good stayers, pulling level early in the second half. After good all-round play, the Gunners snatched a victory five minutes from time. Scorers :—Lieut Pridmore, Smith and Asher, and Taylor (2). 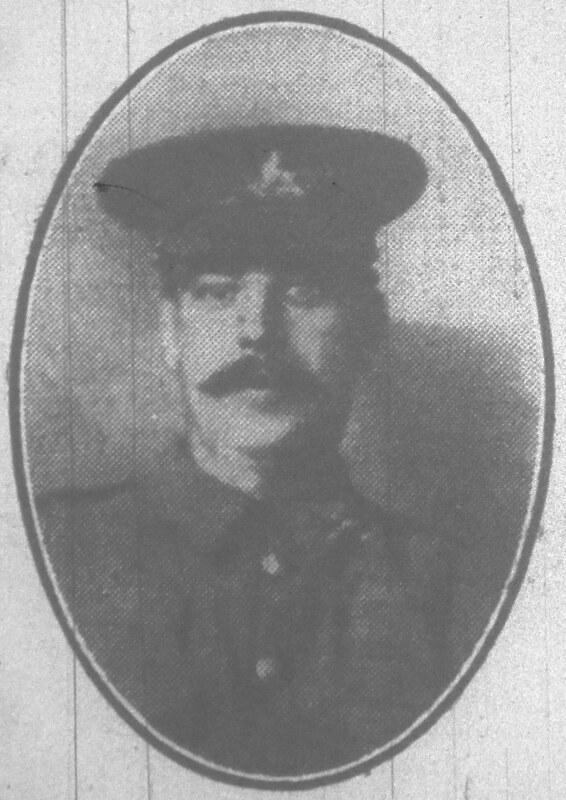 As mentioned in our last issue, news has been received from the War Office by Mr and Mrs Steel, of Cosford, that their son, Edward Steel, of the King’s Royal Rifles, was killed in action at Neuve Chapelle on March 16th. No particulars of his death have come to hand, and the only consolation that his aged father and mother have is that he died bravely fighting for his country. E. Steel, who was 27 years of age, joined Lord Kitchener’s Army on September 2nd, previous to which he was employed by the Midland Railway Company at No. 2 Length, Rugby. He was drafted from Sheerness on February 2nd to go to France with other young men of the villages around. He was much liked, and as he always lived at home with his parents, he will be sadly missed by them, as well as by all who knew him. Mrs H Bottrill, of Bridget Street, Rugby, has received news that her son, Pte Frank Henry Bottrill, of the Royal Warwickshire Regiment, was admitted to Boulogne Hospital on Easter Sunday, suffering from a severe bullet wound in the head, and as the result of an operation he has lost the sight of the left eye. Pte Bottrill who was a reservist, and is married and lives at Wellingborough, is an old St Matthew’s boy. His brother-Pte A W Bottrill, of the Coldstream Guards—was badly wounded on November 2nd, and has never really recovered from the effects of the wound. He has ,however, been back to the fighting line ; but the last news that was heard of him was that he was at Havre recuperating, although he expected to be soon drafted back to the trenches. Mr T Thompson, of Willoughby, has had several interesting letters from his son, who is a member of the Northants Yeomanry. The regiment went out to the front last November, and was one of the earliest of the Territorial forces to go on active service. They have been in several actions, and, as may be supposed have not escaped without their share of casualties. They were in the battle of Neuve Chapelle, and fortunately the quick-firing gun team, to which he was attached, passed through the engagement without mishap. Previous to that they had been nine days in the trenches, and during that time they experienced some very cold weather. Trooper Thompson had one of his feet frost-bitten. He was sent back to the base hospital, where, unfortunately, he developed bronchitis in a somewhat severe form. His latest letters however, state that he is getting better, but it will be some time before he is quite convalescent. The casualties in the 7th Warwickshires reported up-to-date are : One killed and 12 wounded. Recruiting has been rather more satisfactory at Rugby during the past week, and twelve have been attested, the majority for the Army Service Corps. Their names are :—A.H C : L Morris, J C Munton, C H Brown, T W Summers, F Summers, J Ingram, P Kimberley, D Jonathan, S New. Remounts : A Penn. K.R.R : M E Goodyer. Army Veterinary Corps : J W Harris.